All silicone bracelets from AmazingWristbands.com are made of long-lasting, comfortable, latex-free, and non-allergenic silicone. You can create customized Karate bands with your own message. 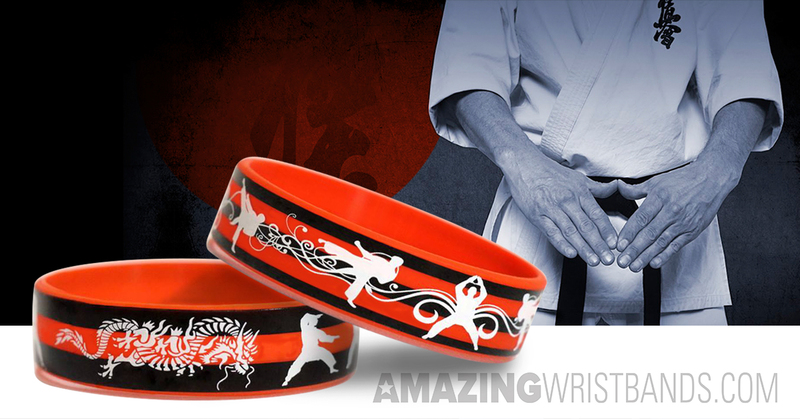 Whether you are promoting your Karate studio, a special Karate event or simply want to show your passion for Karate, we can design custom Karate bracelets for you. Karate is a martial art originating in Japan and dating back to the 18th Century. Created as a attacking method in combat using hands and feet to deliver blows to ones opponent, Karate evolved into a worldwide activity emphasizing discipline, physical activity and defensive maneuvers. Karate generally falls into three main categories of practice. Kihon (basics) teaches the movements of Karate covering striking, blocking, stances and movements that are used in self defense. Kata (forms) practices pre-determined movements choreographed to develop agility, strength, coordination, balance and speed. Kumite refers to sparring against an opponent utilizing skills and abilities developed in the Kihon and Kata stages of study. Advances in ability are recognized by earning colored belts with a black belt being the highest honor demonstrating a rise to the top of Karate. Karate has many benefits for people of all ages. It increases ones physical abilities including increased endurance, strength and coordination. Mentally, it helps one with discipline, concentration and helps develop confidence. Karate and emerged as a sport practiced worldwide. Tournaments are held worldwide and generally broken down by age, gender, size and ability. Karate is currently being considered for the 2020 Olympics which will be appropriately held in Japan. Why Buy Karate Wristbands from Amazing Wristbands? Amazing Wristbands is a leading provider of customized silicone bracelets available online, including bracelets customized to with your message. Our bracelets are comfortable, durable, and non-allergenic. Most importantly, our bracelets are your bracelets. Our professional and friendly customer service agents will help you build your customized, fun Karate wristbands. We offer a wide variety of band types and colors to help your Karate wristbands stand out and make a difference. In addition to standard wristbands, AmazingWristbands.com also offers slap bands, adjustable bands, USB bands, silicone rings and silicone key chains. Experience the difference at Amazing Wristbands! FREE Shipping for Karate wristbands in the U.S.
FREE artwork for your Karate wristbands. FREE Color Matching – choose from our many colors of different sized wristbands! Get a detailed quote for your Karate wristbands in minutes or order by visiting AmazingWristbands.com now.